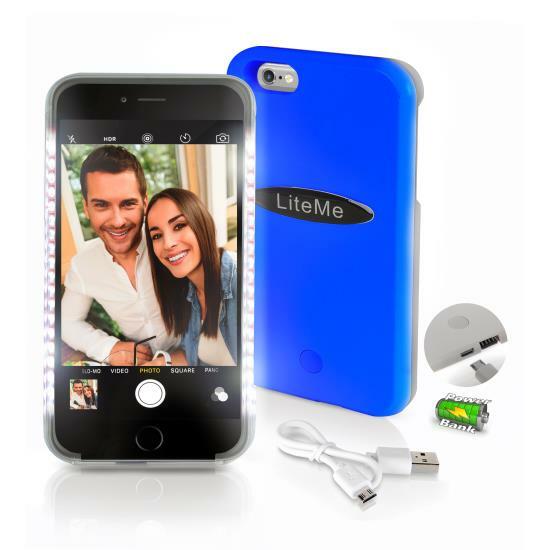 Snap the perfect pictures with the Lite-Me Selfie iPhone Case! Your iPhone easily slips inside and it features super bright LED lights along the frame -- that you can easily turn on or off at the press of a button. This multi-function protective case also features a power bank with built-in rechargeable battery, so you can use it as a backup charger when your battery life is low. Simple one-button operation allows you to add a cool blinking / strobing light effect around your phone -- and it’s also brightness adjustable! The smart case works with the iPhone 6 Plus, and includes a USB charging cable. Add some bright lights, and a bright smile, with the Lite-Me Selfie iPhone Smart Case!